^.^ so here is my new walli ... it is a gift for a good friend! Wow!!! Miaka is wonderful on your wall!!!! She is greaat!!! woww *o*, is very kawaii, the colour, the butterflies. The butterflies are so pretty and I love the pretty effects. Nice use of green and a nice character ^___^ . Excellent work. The colour scheme fits the image overall. Good job. the effects you made and teh colors and teh buterflies it all fits together very nicely. and it all suits the girl. wow very nice...i'm speechless... I love the bg effects and the butterfly looks like crystals. I love it. You choose a beaufitul green that complement the dress of her ( sorry I don't know her name... I haven't seen the serie...yet) it's a fav. to me. great job. Nice job! Butterfly effects and sparkles - so crisp and clean indeed. It looks dazzling and marvelous. Keep up the good work. but I gotta ask, the black thing is it a mountain? or is it a field/watever where Miaka is standing? Cool butterflies!! 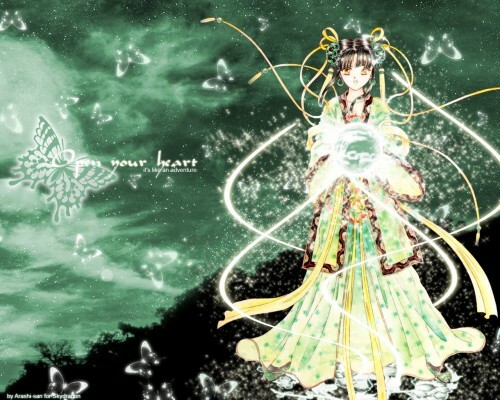 :) This wallpaper looks real nice, love the dress of Miaka :) The sparkly orb she's holding as well.